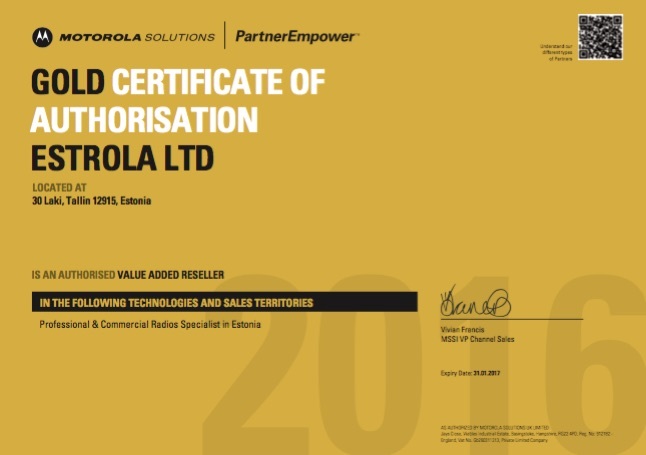 Estrola OÜ was founded in 1992 and is the authorized official representative of American corporation Motorola Solutions in Estonia. Motorola Solutions is a worldwide leader in the area of telecommunications, wireless and broadband connection supply. Bringing to life the idea of absolute mobility, Motorola Solutions is one of leading producers of digital and analogue equipment, supplier of commercial radio equipment of licensed radio band, wireless broadband systems, mobile computers, RFID scanners, telemetry equipment, components and accessories. Based on valid contracts Estrola OÜ supplies the production of Motorola’s partners and independent producers such as Astron, Celwave, Gai-Tronics, Otto Engineering, Peltor, Procom, Savox, SmarTrunk, Telewave, Vertex and others. Estrola OÜ pays a special attention towards new production types and is distribution as well as control over expenditures and price strategy.